RevK®'s rants: Are you sure it is Thursday? Well, yesterday was a tad strange in that is seems a number of publications that normally happen on a Wednesday did not happen or were later than usual. But now I am wondering about Thursday - it seems that it is two days, so maybe that is where Wednesday went. How the hell do they fit two days in 27th to 27th of October? 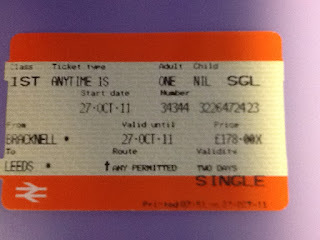 I suspect the validity on an Anytime Single is two days because of the 'overnight stay' rule - that is, if you start your journey on 27 October but cannot complete it that day (e.g. because you run out of trains), you are allowed to resume your journey the following morning before a certain time. "Break of journey for an overnight stay is allowed. Where a journey continues into the next day, travel must resume before 1200 and no further break of journey is allowed except to change trains."